Learning is a lifelong pursuit. Regardless of your skill level, your formal education, or how many years you’ve been in the game, there’s always something more to learn. Whether you actively pursue it, by attending classes or reading up, or just learn by doing, paying attention to what you’re learning is crucial not only to your personal growth, but to the success of your business. Portrait photographer Sue Bryce has an enviable career — her work is exceptional, her clients love her, and her self-employment as a photographer has allowed her to travel, to meet fascinating people, and to change lives through portraiture. And even though she, herself, has taught countless students about the business and art of photography, she says that the entire process has been a journey and that, though she is largely self-taught, she’s also been shaped by other people. 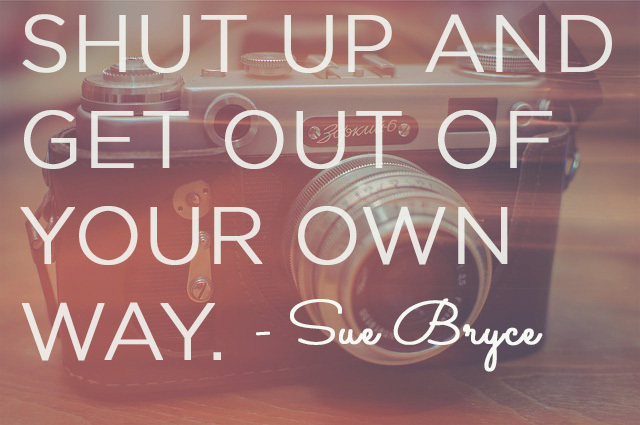 Get more inspiration and insight from Sue Bryce with 28 Days of Portrait Photography. Check it out. Education, says Sue, can come in many forms — and self-education can be hugely valuable. But often, we look down on autodidacts. That feeling — feeling like a loser (hello, Impostor Syndrome!) — is often enough to dissuade individuals from pursuing the kinds of careers they want. However, says Sue, for her, self-education was the way out. “I learned to be better with money. I learned to run a business,” she explains. Instead of taking out loans to go to school, she learned by doing. Additionally, says Sue, a large part of learning comes from teaching. And while many photographers keep their trade secrets close to the vest, Sue is an open book. And what advice does she wish she’d heard when she was just getting started? Sue says she has “no regrets” about her experience, but does admit that she’s envious of today’s upstarts: “I wish we had had online training back then,” she says.